The next generation of biotech food is headed for the grocery aisles this year. While the first up may be salad dressings or granola bars make with soybean oil genetically tweaked to be good for your heart, DNA edited foods will soon follow. Unlike genetically modified food of the past, these new foods are being hailed as a means to boost nutrition, spur crop growth and make farm animals hardier and fruits and vegetables last longer. The new CRISPR technique for editing the genes of plants and animals is being hailed as a more acceptable face of genetic engineering since it doesn’t rely on the insertion of genes from one species. Advocates claim there will be no chance of strange interspecies complications, no random mutations – just a “little” editing to subtract what we don’t want or add what we do want. Not surprisingly, it turns out that CRISPR may not be as accurate as advertised. A recent study revealed that “in around a fifth of cells, CRISPR causes deletions or rearrangements more than 100 DNA letters long. These surprising changes are sometimes thousands of letters long.” Oops! As scientists in labs across the world create virus-resistant pigs, heat-tolerant cattle and fatter, more muscular lambs, a big question looms: Will regulation, safety concerns and public skepticism prevent these advances from becoming anything more than fascinating laboratory experiments, or will the animals transform agriculture and the food supply? China is working on implanting human genes into Holstein cow embryos to produce human like milk. They’ve inserted the gene for human lysozome (HLZ), which is involved in significantly more than production of milk. It’s an organelle, which is found in most cells, that’s involved in intracellular digestion. Thus, the entire cow’s body has been turned over to production of human-like cellular digestion. Naturally no one ask the cow how they felt about it but it is hard to imagine that it is anything but harmful to the cow. And, so far, the reality is that there has not been any milk produced that comes near duplicating human milk. All that has been accomplished is the recreation of a single human molecule in cow’s milk. SAB Bio Therapeutics of South Dakota is genetically engineering cattle to produce large quantities of human antibodies that will help remove harmful foreign pathogens like MERS, Ebola and influenza from the body. Once the cows have been vaccinated with a targeted disease antigen that spurs the cows to produce antibodies, scientists will harvest the plasma and separate antibodies out to create a therapeutic drug. The whole process, according to the company, takes about two and one half months. The only problem, or at least the only problem they are willing to admit, is the cost. According to the World Health Organization each cow can only produce from 150 to 600 grams of antibodies each month. The high cost means that many countries that need the drugs could not afford the drugs. What else is new, right? Scientists in the UK and US are working on altering the genes of Holstein dairy cows, the world’s highest production dairy breed, to make them hornless because they claim it makes them safer to work with and spares the cattle the painful dehorning practice currently in use. For farmers seeking to maximize beef production, all-male cattle could be a win right? 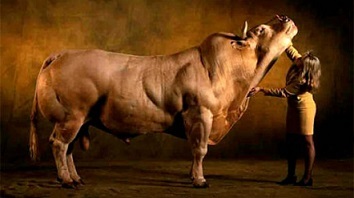 After all bulls gain more weight than females. At the Beef Barn, part of the University of California at Davis’s sprawling agricultural facilities, cows have been implanted with embryos genetically edited to grow and look like males, regardless of their biological gender. Many advocates and ethicists agree that the current oversight system of these genetic modifications is not up to standards. In addition, they believe that the scientists and the industry both under estimate potential safety concerns, the biggest of which is what is called off-target edits which is the unintended changes to DNA that could affect an animal’s health, according to Jennifer Kuzma of the Genetic Engineering and Society Center at North Carolina State University. Critics also say that editing animal DNA could introduce unwanted mutations that pose a threat to human health when consumed, and they fear that mutated genes may spread unchecked as animals breed. “The belief has spread that scientists know how gene editing works, all the time, under all conditions. We, of course, do not.” Odd-Gunnar Wikmark, a researcher at the Norway based foundation GenOk.